The Lake District is one of the most sparsely populated areas of the country but is the home to the towns of Keswick, Windermere and Ambleside, in which all modern amenities can be found. Many visitors to the area come for the sheer beauty, peace and relaxation that can be found in abundance. Walking, climbing, watersports and many other activities are available during the warmer months, however the Lake district is known to be the Dampest part of the country and the weather be somewhat changeable. Many species of plant and animal life can be found in the Lake District, from the darkly coloured and sometimes shy Fell ponies, to the Vendace, a fish found in only in Derwent Water that is very rare and under protection to try and preserve the breed. Forestry, sheep farming and tourism are the areas main industries today, although mining for copper, lead and slate have played a large part in shaping the landscape over the years. 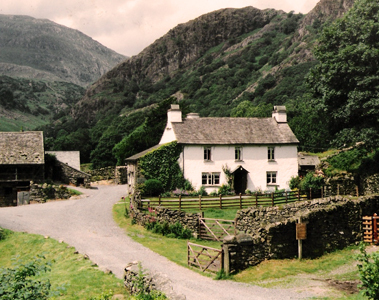 The Lake district has had a long association with the arts, theatre and writers, in particular William Wordsworth who spent 60 years living and writing in the area. The famous children’s author Beatrix Potter was also inspired by the landscapes of the Lake District and her Peter Rabbit books are still enjoyed by many children today. Many published authors have spent time in the Lake district over the years and the area has a history quite unlike other places in the UK. Cumbria lies on the North West coast of England, and has a good infrastructure in place. Travelling between the cities is easy by road or public transport with major towns easily accessible. Over 20 lakes form parts of the Lake District National Park and the best way to see some of these magnificent lakes is by paddle steamer. Paddle steamers on lake Ullswater have been a major attraction since the 1860’s and still give cruises of the lake today and can also be hired for private functions. Walking in the Lake District National Park is a favourite of many visitors, and informative leaflets and guides can be found at various places around the Lake District. Marvel in the scenery, flora and fauna or just enjoy a picnic in the wonderful surroundings. If you’re looking for a fun day out there are many museums, galleries, activity centres and local crafts available locally. With wonderful Cumberland sausages produced and sold in the area and an abundance to see and do you will fall in love with the Lake District and all it offers. Previous Previous post: Make a splash while house sitting in Beautiful Bath!